Your bed should never make noise when you’re changing position or your partner moves. If you hear creaking, clicking or crunching, this means that either your foundation is not strong or level enough or that the springs in your mattress might have had their day. Noise can be a serious sleep disruptor. Time to choose a quiet mattress. If you wash your bedding every week and something still smells a little off, you might need a need a new mattress and/or pillows. While a “new smell” is normal, it should dissipate after a few weeks and you should not be able to smell anything. Considering how much time we spend in bed (approx. 30,000 hours over a 10 year period), the number of dead skin cells we shed combined with perspiration and oils that might get through our sheets over time, there is quite an accumulation of organic matter that is welcome food for bacteria and mold. Time to freshen up and look for breathable, natural materials when you choose your new mattress and bedding. Mattresses do wear with use and they should. If the weight of your body doesn't cause the mattress to yield, your body will experience increased pressure in the shoulders and hips. This yielding leads to the mattress' gradual breakdown. Put another way, either the mattress wears out or you do. A well -built mattress with durable, flexible components will generally last about ten years. Wear will occur gradually without dramatically affecting comfort or function. 10 years is also a good time to consider if your needs have changed. After all we need the best comfort and support for the body we live in today. The accumulation of dust mites in old mattresses and pillows can cause allergic reactions such as a runny nose, sneezing, and itching. You will also not breathe well while you’re asleep resulting in poorer sleep quality. If you find that you are waking up with a stuffy nose outside of hay fever season or your asthma symptoms are getting worse and more frequent, think about freshening up your mattress. Learn more about dust mite allergies here. As we get older our bodies change – we experience weight changes and our bodies distribute weight differently. We tend to lose muscle mass while our joints and skin get more pressure sensitive. People 40+ start preferring mattresses with more pressure relief, especially if they are side sleepers. Now it’s time to look for a mattress with premium components where you don’t have to sacrifice durability for a sumptuous soft feel and effective pressure relief. You feel motion, every time your sleep partner moves. This is a common sleep disruptor with mattresses with conventional coils and/or bad foundations. Choose a new mattress with independent pocketed coils/ and or latex. You will wake up refreshed, be more relaxed and your sleep partner will be relieved that you don’t grumble about his/ her nightly flip-flops any longer. This is the most obvious clue. If your mattress shows clear dips and sags independent of the foundation, it is no longer able to support your body properly. You will not be able to rest comfortably and it’s time for a change. Remember – Sleep is important and life is too short to sleep on a bad mattress! Lots of manufacturers are offering mattresses made with natural latex and that’s a good thing! Latex is an amazing performance material. However, in an effort to differentiate one type of latex from another, marketers come up with claims implying superior quality that appear to have been adapted from the wine industry and do NOT APPLY to latex. Please read below to understand why with latex it is much more the “winery” than the “vineyard” which determines the final quality of a latex core, topper or pillow in your bed. “SINGLE ORIGIN” There is always some variation in the latex milk as it comes from the tree. Variations based on clone, season, soil, different trees, age of trees etc. As trees are only tapped every 3 days, daily batches from one plantation show variances too. Blending latex from many trees and different plantations is a good thing because it means that such variations are mostly evened out and the final product more consistent. After all you want to receive the mattress feel you fell in love with in the shop and not something softer or firmer. “OLD GROWTH” It is widely agreed upon in the wine world that old vines make a better wine since they produce less grapes with a more concentrated flavor. However, when it comes to raw latex, it does not matter one way or another if the latex comes from young or old trees. Far more important than the actual source of the latex is how the latex is handled once it leaves the tree. This is where good factory hygiene and state-of-the-art process control come in. Give a good processor a good quality raw material with good field preservation and they can make excellent latex for you. A bad processor can take the same raw material and turn it into a very average quality with inconsistencies. This is why we buy from Vita Talalay, expert manufacturers in The Netherlands who have been producing Talalay for nearly 60 years. They use state-of-the-art manufacturing and quality control equipment and have highly trained people with the knowledge and experience that comes from having made this wonderful comfort material for many decades. The first time sleep apnea was historically recorded was around 460 BC. The Greek god of fertility, Dionysus, son of Zeus and Semele, surrounded himself with women, the Maenads, who used thyrsus sticks (stalk of the narthex, sacred plant of Dionysus, a giant fennel) with a pine cone on top to gently poke the god back into breathing when he snored and stopped breathing. The first dissertation about the "Snoring of the Sleeping" - RHONCHO DORMIENTIUM -was published in Latin in 1745 by Fridericus Wilhelm Lust at the University of Halle Magdeburg, Germany as part of his medical doctoral degree. In the American Revolutionary War (1775-83) cannonballs were strapped to the backs of snoring soldiers to prevent them from sleeping on their backs. 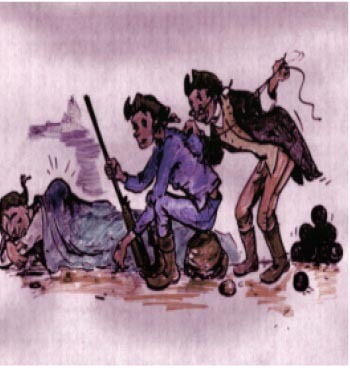 The aim was to prevent weakening of troop morale through sleeplessness caused by loud snoring and also to avoid betraying the location of the sleeping soldiers to the enemy. In 1887 snoring was the subject of a first caricature in the satirical magazine of the Münchner Bilderbogen (Munich, Germany). In 1892 Otto Franke developed a first oral prosthesis to prevent snoring. Between 1893 to 1919, chin-bandings came to the fore as the inventions of Pulford, Jacob, Rothenberger and Galiardo. In 1900, the cannonball theory was “redesigned” by L.W. Wilson who developed it further by using a tether to attach a metal spiky-ball-construction to the sleeper's back. Mouth prostheses, such as those by R. Gravey or E. L. Leppich were developed. Before 1960, sleep respiratory failure was referred to as Pickwick Syndrome (after the novel by Charles Dickens). Then the nomenclature "sleep apnea syndrome" was adopted. Today, doctors distinguish between Obstructive Sleep Apnea (OSA) and Central Sleep Apnea and offer a variety of solutions. Shoulder pain caused by your mattress? Pain or discomfort from shoulder pressure is often reported as a cause of sleep disruptions. In order to address this issue we have to understand how a shoulder joint is constructed and what is special about this joint: The shoulder is the most mobile joint of the human body with a less stable bone structure compared to the hip where the socket holds and guides the femoral head in a ball-and-socket type joint. 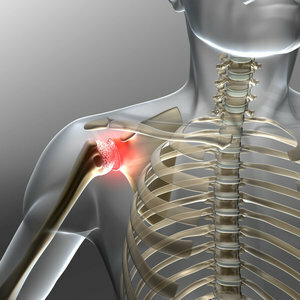 The shoulder joint is secured only by muscles and ligaments. For this reason, the shoulder tends to become unstable when there is too little muscle mass or muscle imbalances. Frequently people have a muscle imbalance in their shoulder area where the anterior muscles are shorter than the posterior muscles and pull the shoulder joint forward from it's neutral correct position. If a joint does not sit exactly where it should, this can lead to increased wear resulting in an impingement syndrome, arthrosis or other painful conditions. Untreated shoulder pain can become chronic. During sleep, muscle tension is decreased and the shoulder is even less stable which can further exacerbate inflammatory conditions through incorrect positioning and pressure during a time when healing should take place. If you are a side sleeper and your mattress is too firm in the shoulder area, your shoulder alignment will be off center and irritated structures will be compressed. This creates discomfort, pain and tension all the way up to the cervical area. In addition, vessels and nerves can be compressed triggering a tingling sensation in the arm or hands. However, too much firmness in the shoulder zone is not always the single cause of shoulder pain. The shoulder zone must offer good give and pressure relief, but if at the same time, the whole mattress is too soft, this can also contribute to shoulder pain. Insufficient support in the waist/ lower back will affect your shoulder by the vertical forces of your body's weight pulling on the shoulder from the center of your body. It is also important to choose a pillow at the right height and firmness level. SUPPORT IN THE LOWER BACK (LORDOSIS) MUST BE INCREASED UNTIL THE BODY DOES NOT SAG IN THE WAIST ANY LONGER. Other than undifferentiated box springs or rigid platform foundations, the curved slats in our flexible slat foundation provide both suspension and contour for greater comfort and pressure reduction. In addition the firmness of slats can be customized to your body weight and shape for targeted support. THE SLAT SUSPENSION WAS INVENTED IN BREMERVÖRDE IN GERMANY IN 1957 AND STILL ACCOUNTS FOR THE VAST MAJORITY OF BED SALES IN NORTHERN EUROPE. Our latest Plein-Air Wool® delivery just came in. Check out all these bales and bales of creamy fluffiness! 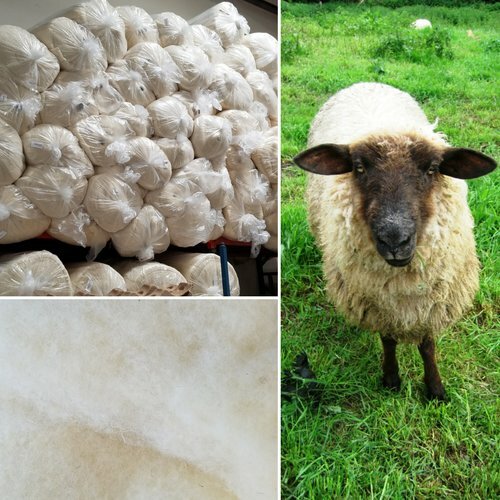 Did you know that Plein-Air Wool® is the term used for wool that comes from sheep which live outside all year round. This livestock husbandry results in a naturally more curly and longer fiber. The strong natural curl provides lasting resilience, bounce and loft that is superior to mechanically crimped wool fiber which will mat down faster. The artificial crimping process used by some wool producers creates strain on the fibers causing them to break easier under pressure which results in shorter fibers. This has a direct negative effect on the long-term resilience and loft of the product. Our Plein Air Wool comes from farms in France and is processed into fluffy rolls in Germany. We then quilt those to our organic cotton stretch to produce your mattress cover.There are no harsh chemicals used during the wool growing and processing steps. The sheep are not dipped or treated with any pesticides or herbicides. After shearing, our wool goes through three washing cycles with increasing temperatures (90° - 140°F) followed by a cold rinse in pure water. During the washing cycles pure baking soda and water is used – nothing else. The drying takes place in drum driers and the wool is then cooled down on cooling racks for 24-28 hours before pressing and packaging. sleep-deprived driving (commonly known as tired driving, drowsy driving, or fatigued driving) is the operation of a motor vehicle while being cognitively impaired by a lack of sleep. Sleep deprivation is a major cause of motor vehicle accidents, and it can impair the human brain as much as alcohol can. In the United States, 250,000 drivers fall asleep at the wheel every day, according to the Division of Sleep Medicine at Harvard Medical School and in a national poll by the National Sleep Foundation, 54% of adult drivers said they had driven while drowsy during the past year with 28% saying they had actually fallen asleep while driving. According to the National Highway Traffic Safety Administration, drowsy driving is a factor in more than 100,000 crashes, resulting in 1,550 deaths and 40,000 injuries annually in the USA. Added up, this number of deaths would be the equivalent of several fully loaded airplanes crashing every year. 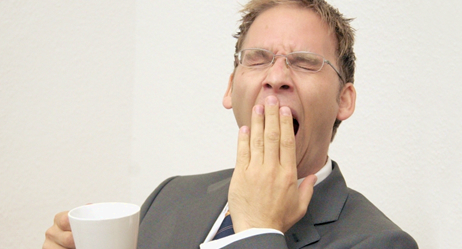 When a person does not get an adequate amount of sleep, his or her ability to function is affected. Their coordination is impaired, they have longer reaction time, impaired judgment and memory. It's worth getting help to analyze how you can improve your sleep and a new sleep system or pillow might help to address any heat or pain issues that prevent you from getting a good night's sleep.